Signing the dark. . . . The lucky reader will find an image that refuses to fade from memory: say Eliot’s patient etherized upon a table, Dunbar’s caged bird, or perhaps Kelly’s comparison of signing hands to the m ovements of bats. In “Pipistrelles,” Kelly provides not only visual imagery but auditory imagery: the alliteration of damp dusk, the sibilance of spies and counterspies, the dactylic beat of restlessly signing the dark. The flung hands haunt imagination and suggest the energies of self-expression, and also our imprecise control of language—flung—pitched outward, away from. Restless hands flung forward try to give meaning and describe darkness, a darkness that grows metaphorically larger and more than merely night. And what of spies and counterspies? Aspy who observes carefully, who uncovers secrets. Bats in flight whose movements mimic those of young boys who do not hear. Language the poem suggests is not limited to the construction of our words but is also a performative space that engages our bodies. This is a Brigit Pegeen Kelly poem, however, and so no simple comparisons: “The bats looked like the flung hands of deaf boys.” But rather the image seamlessly expands into a Homeric simile. The world imagined by the poem is enlivened by personified trees and shadows and bats. 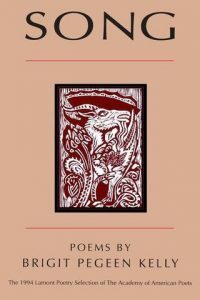 The poem denies any distinction between the natural world and the human, perhaps showing how we use language to make the natural world familiar, like us, and as a result less fearful, while also making the human world more naturally mysterious. Our thoughts. . . . This entry was posted in A Space for Image on February 4, 2018 by admin.